I am the type of girl who doesn't mind carrying almost everything in my bag. I hate it when I can't find something I need and realize I left it at home. This holds true to my clinic accessories, reading and writing materials, gadgets and most importantly my touch up bag or kikay kit as most of us fondly call it. It's been my routine to bring all the stuff I use on my face in the morning. These things include toner, moisturizer, powder, makeup palette, makeup brushes, lip balm, lipstick, oil blotter, mirror, tweezers, nail cutter, cotton and q-tips. Needless to say, that's quite more than a few pieces and though most of them are in travel sizes, they still take up much space in my bag. I never realized I could cut down on them until one day when I accidentally left my kit and all I had in my bag was a lip tint and a comb. My first reaction was how on earth will I go through the day without my touch up kit? But surprisingly, I did survive with just 2 among the array of things I bring everyday. Though I still find myself stuffing my kit with things I could leave home without, I am happy to say that in the past days I am able to survive carrying only a small pouch containing just the essentials. So without editing out a single thing, I snatched my kikay kit from the bag I used yesterday to show you my never-leave-home-without beauty essentials. 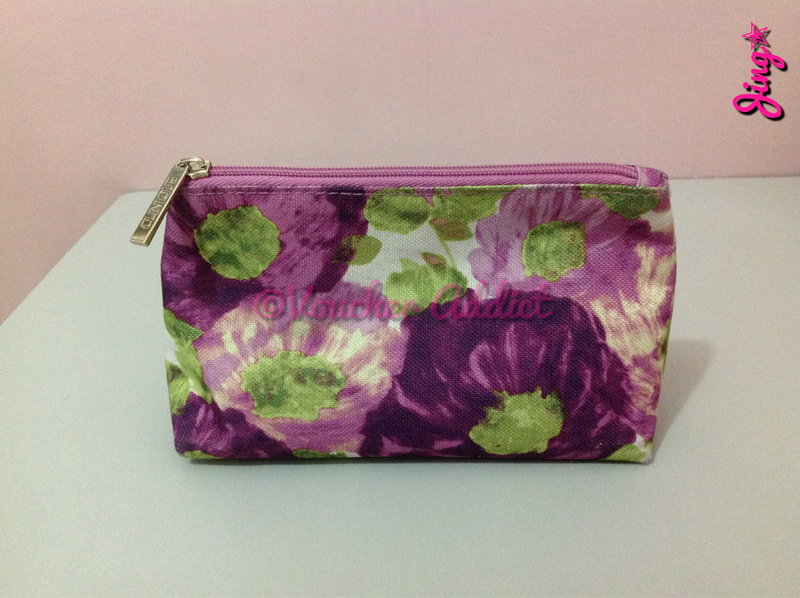 This is a nice pouch I got as a freebie from Clinique Trinoma when I bought their eye serum and loose powder. It actually came with other free Clinique trial products like the turnaround concentrate and instant facial masque, superdefense moisturizer with SPF 25/PA+++ and high impact lipstick with SPF 15 in RSVPink. Anyway, the size of this pouch is already an achievement for me because my previous kit is twice larger than this. This kikay kit holds all of the following essentials to get me through the day. (1) Clinique derma white brightening loose powder in translucent glow (20 g) is the powder I prefer bringing because it's perfect for touch-ups. 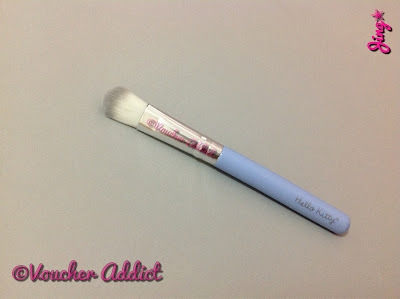 It comes with its own application brush and it does miracles by restoring your skin's radiant glow. (2) Physicians Formula happy booster glow and mood boosting blush in rose (7 g) is the blush I use for touch ups during humid days because it livens up your complexion while keeping it oil free. (3) Smashbox O-Glow intuitive cheek color (15ml) is my other go-to blusher especially during the cold season when my skin tends to look dry. This happens because low temperatures deplete the skin its natural lipid layer which keeps it from drying out. The gel based formula not only gives you a natural blush but it also helps moisturize your skin. Click here to see my previous review on this. (4) The Body Shop brush on bronze (23 g) is my all time favorite bronzer. These are small meteorites intended for the entire face but I've been using this as an eye shadow and I love the way the color matches my dark eyelids. I never thought I'd find the right shade that best suits me until I got to try this. 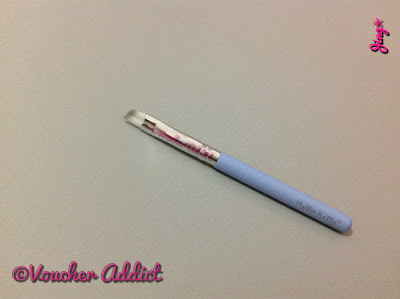 (5) The Body Shop tweezers perform really well when it comes to grabbing even the shortest hair. The chiseled edges are also perfect for removing fine hair without any breakage. It comes in a small pouch so you won't have to worry about scratching the containers of other beauty products in your kikay kit. 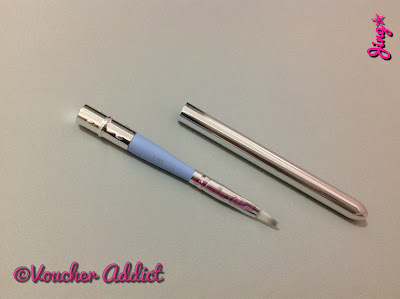 (6) She Uemura eyelash curler is the only tool I love using for my short and sparse eyelashes. Click here for my separate review on this must have item. (7) Tony Moly magic blossom mascara is another favorite that I discovered just recently. It gives your lashes just the right length and volume without smudging and flaking over time. Click here for a full review. (8) Vaseline lip therapy in cherry (10 g) is one of my recent favorites when it comes to preventing and treating dry, chapped lips. It's in a small squeeze type tube, has a soft texture that spreads smoothly on your lips and gives off a subtle cherry taste. (9) Tony Moly berryberry magic lip tint has totally raised the bar on quality lip products in the market. This affordable yet high performing brand has proven that not all products that work come with a hefty price. You may click here for a detailed review. (10) Kleenex oil control film has replaced my old brand in the past years. This surprisingly affordable oil blotter leaves your face oil free and fresh after each use. (11) Hello Kitty lip brush has proven to be an effective tool for me since I started using it with my Vaseline lip therapy. The soft bristles work well by spreading lip products evenly and easily. This came with other make up brushes in a cute set which I got as a gift. Please click here to read my review on this as part of the set. 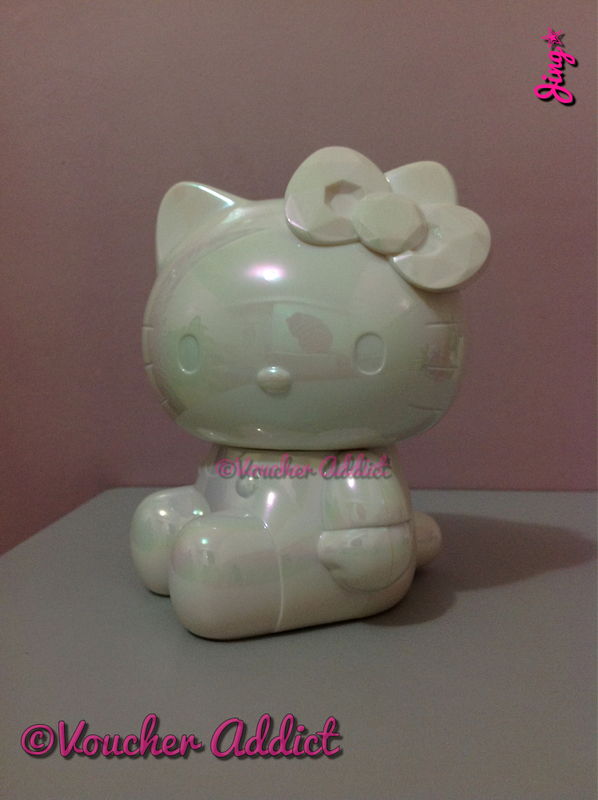 (12) Goody compact mirror is truly a must have for every kit. As the name implies, this is a small compact containing a regular mirror and a magnifying mirror essential to all kikay kits. 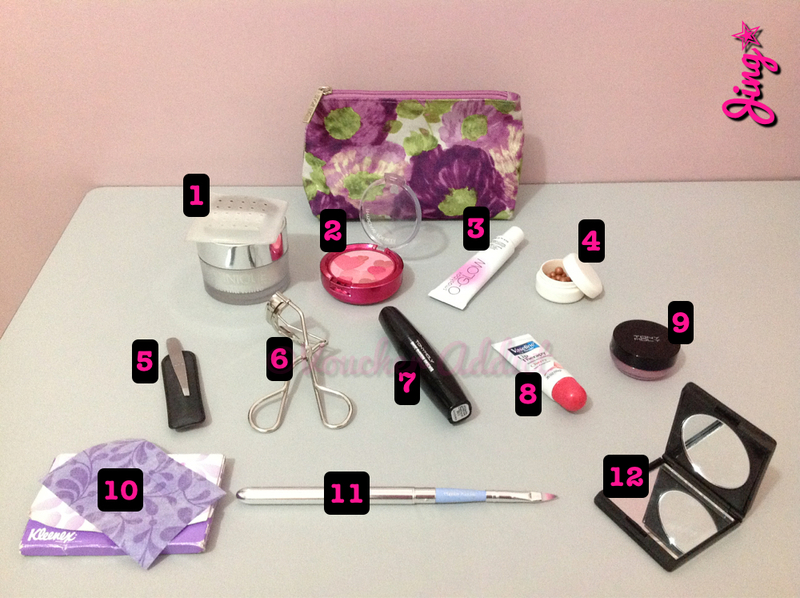 There you have it, a list of the things I consider essentials in my kikay kit (plus a mini review on each). Though I still have more than a few things cramped in my bag, believe me, this is far better then what I used to stuff my kit with. How about you? What are your kikay kit essentials? Price of each product may have changed over time. All products mentioned in this entry are personal preferences and are in no way intended to be used for any type of advertisement. I just want to tell you about this product I got as a gift from my cousin (Raquel/Bebeh) that I'm loving so much! 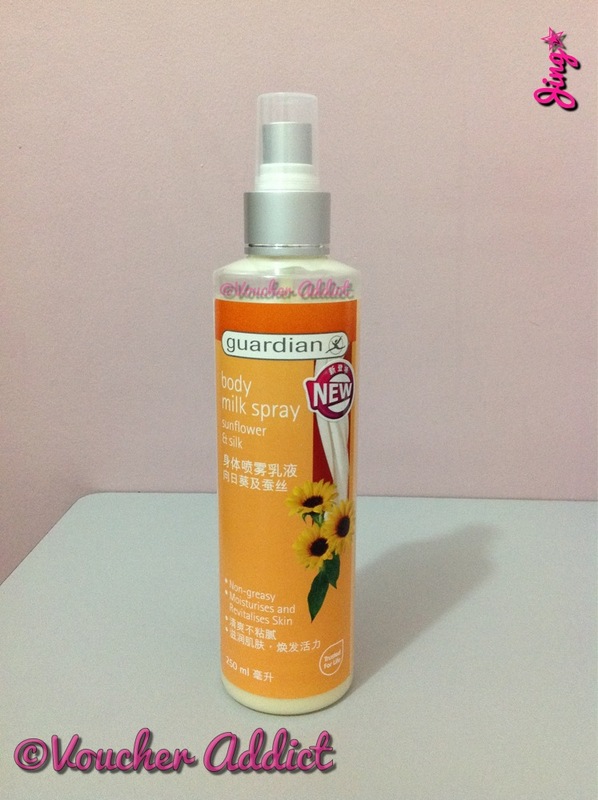 Guardian body milk spray with sunflower and silk which comes in a 250ml spray bottle. 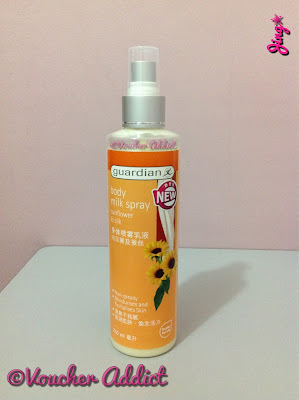 Guardian body milk spray is enriched with sunflower oil, hydrolyzed silk extract and vitamin E. It is non-greasy while revitalizing and moisturizing skin with subtly scented unique sunflower aroma that invigorates and refreshes. 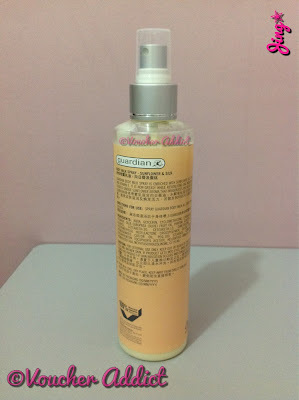 I have never seen anything like this before and after using it for the first time, it became an instant favorite. It also made me wonder why it took so long for a product like this to be released in the market. This was on sale when my cousin bought it from Guardian in Singapore. Guardian is a health and beauty store which resembles Watson's here in Manila. It's no secret that milk has been used as a skin care product since Cleopatra's era and this is why several labels have developed different vehicles that promote milk as a main component. Bar soaps, body soaks and lotion are the most common milk based products available, but I have never encountered a body milk spray. It gives off a clean, fresh scent, instantly hydrates your skin and keeps it moisturized without feeling greasy. Sure there are tons of others like this that give the same benefits but what made this particular product stand out from the the rest include ease of application and great value for your money. Though this product doesn't offer sun protection, I still love it and I do recommend it to those who want to maintain a healthy skin in an affordable and effective way. You might want to use this as an alternative to body oil. If you use this during the day, don't forget to top it with a sunblock since this doesn't offer sun protection. I use Belo Essentials sunscreen lotion with spf 15 but as recommended you might want to use one that offers at least an spf 30. Products that work for me may not work in the same manner with others, it all boils down to individuality, finding the right product that best matches your skin. Products mentioned in this entry are all personal preferences and are in no way intended for advertisement. No matter how old you get, there will always be a child within you. 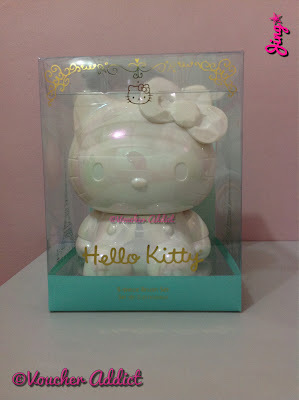 In my case, the child within me never fails to show up at the sight of Sanrio's most loved character, Hello Kitty. 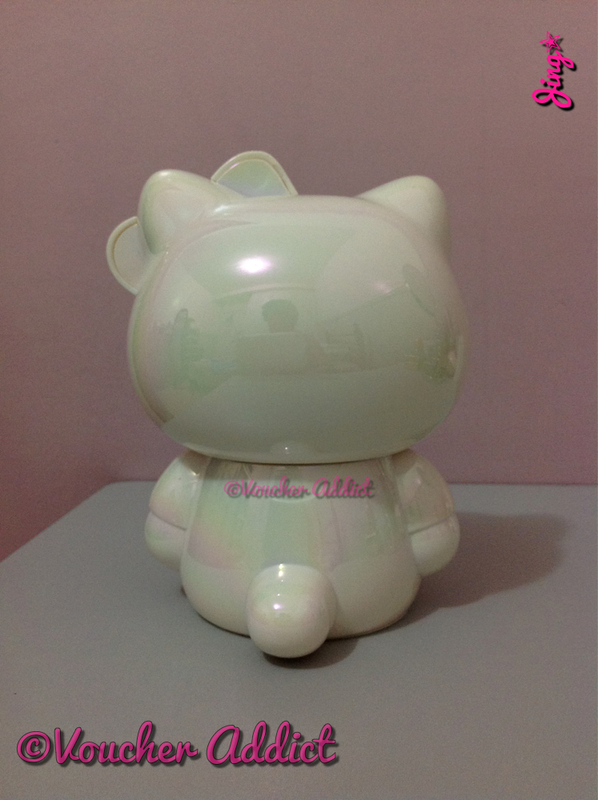 Though Hello Kitty's style and looks evolved in the past years, it still managed to maintain its charisma not only on little girls but big girls as well. 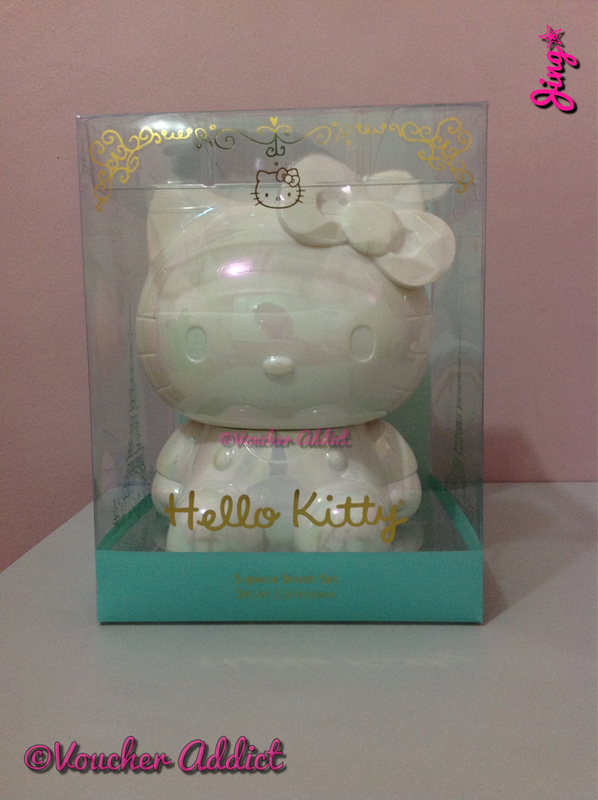 In the past, Hello Kitty products are limited to stuffed toys, stationery and school accessories, but now, you wouldn't be surprised to find jewelries, cosmetics, apparels, gadgets, appliances, even food, bearing the famous Hello Kitty logo. 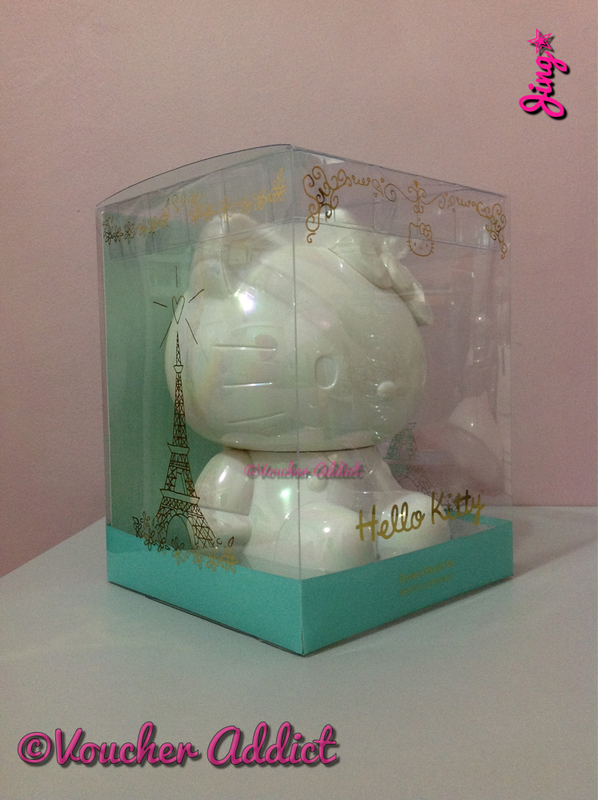 Of course, being an avid follower, I have accumulated a few HK stuff as well but none of them compares to what I got as a gift from my fiance. Seriously, what could be more adorable than this? 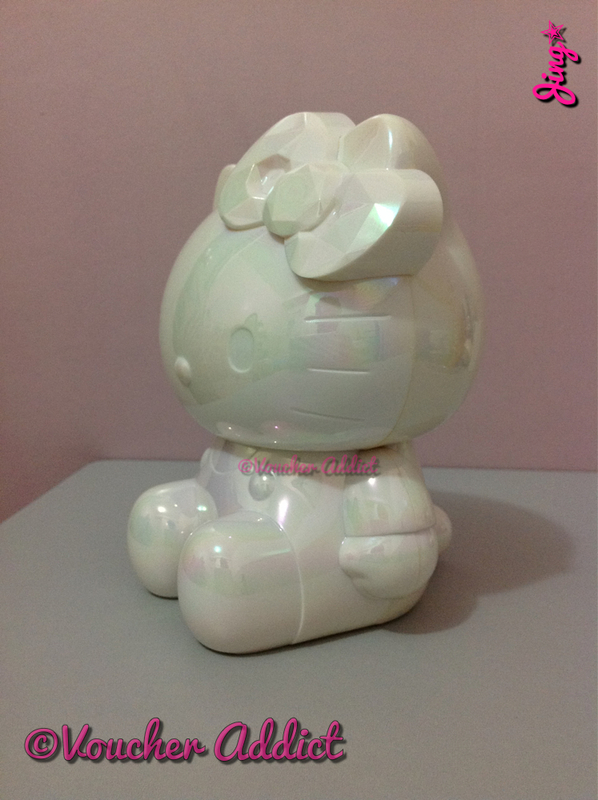 I love it just the way it is, a 3D image of my favorite character in a shiny white pearl finish. It actually took me a while to unbox this because I was still admiring the packaging. 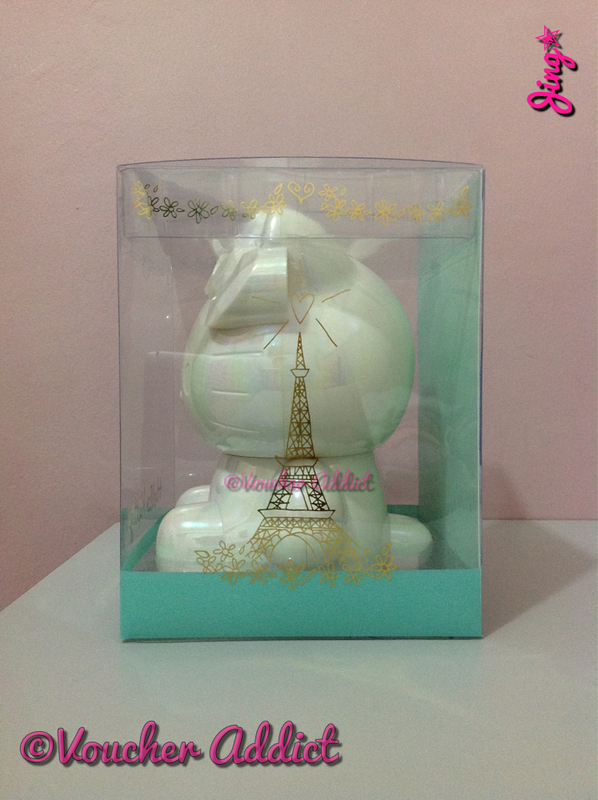 It was securely placed in a sturdy transparent box with its base snugly tucked into place. 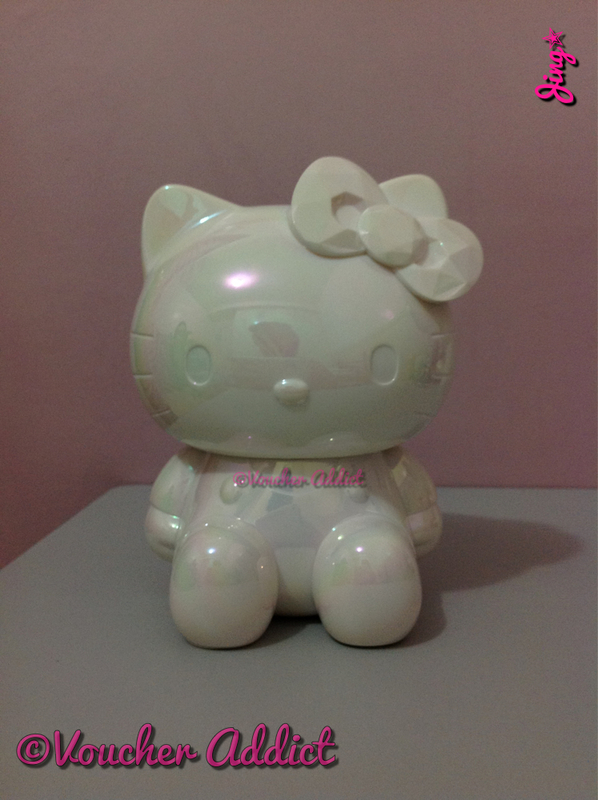 The texture is comparable to a perfectly applied nail polish and the head can be turned freely towards both directions. If you're an avid fan too, I know what you're probably thinking.. Could this get any better?.. YES!!! Inside is a 5-piece brush set in travel size. The brush handles come in light blue and silver, not the typical pink color that you expect from Hello Kitty, but they look cute just the same. The set has one face brush, 3 eye brushes and a lip brush. 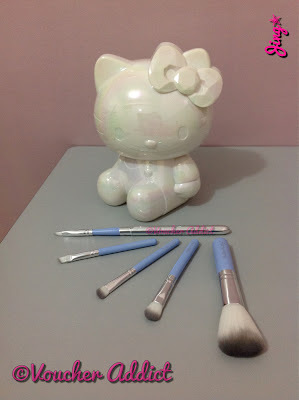 I also love the way each brush is labeled with Hello Kitty on one side and their specific function on the opposite side. 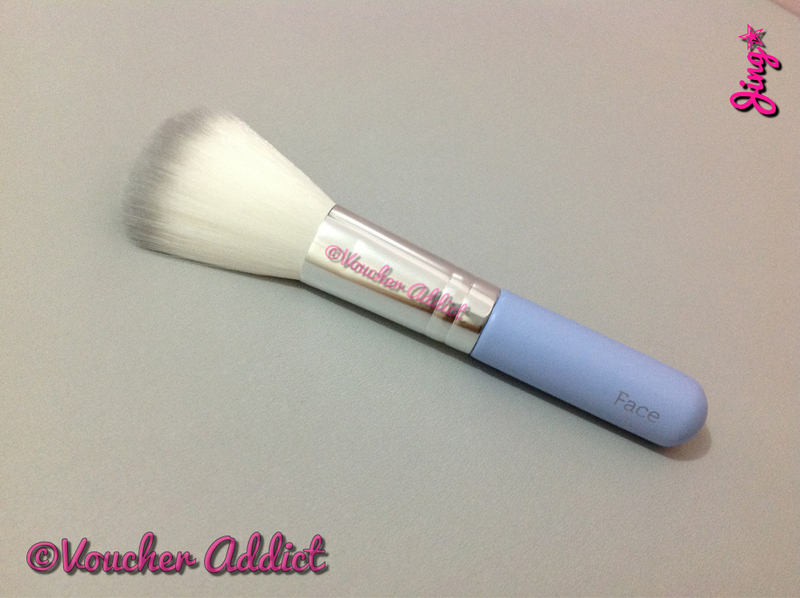 This one's obviously a face brush which can be used as a powder brush and blush brush. 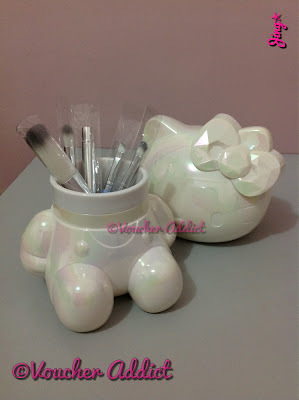 You can also use it for contouring or highlighting. The fibers are so densely packed that you wouldn't believe it's in travel size. The eyeshadow brush has the right volume and thickness that can easily pick the color from your palette and effectively pack your lids with it in just a few strokes. 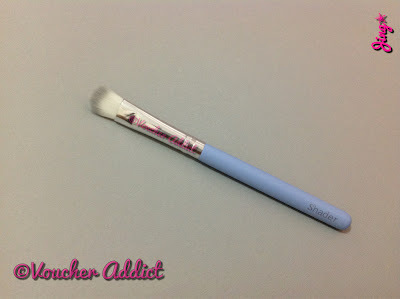 This also doubles as a blending brush when used upright in a circular motion. 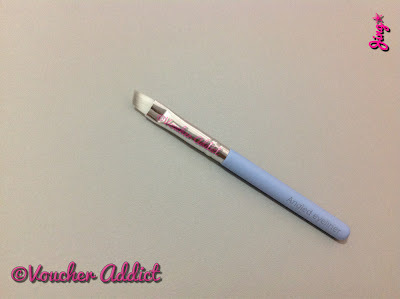 This brush works well with blending but I find it more useful in applying a contrast highlight on your lid's crease line because of the bristles' tapered edge. I use this to accentuate the color on my lids. I am not a fan of eye liners but for the sake of doing this review, I tried using this several times and I must say I am impressed with how soft this brush is. Judging by the way the angled brush looks like, I thought the bristles were stiff but they weren't. 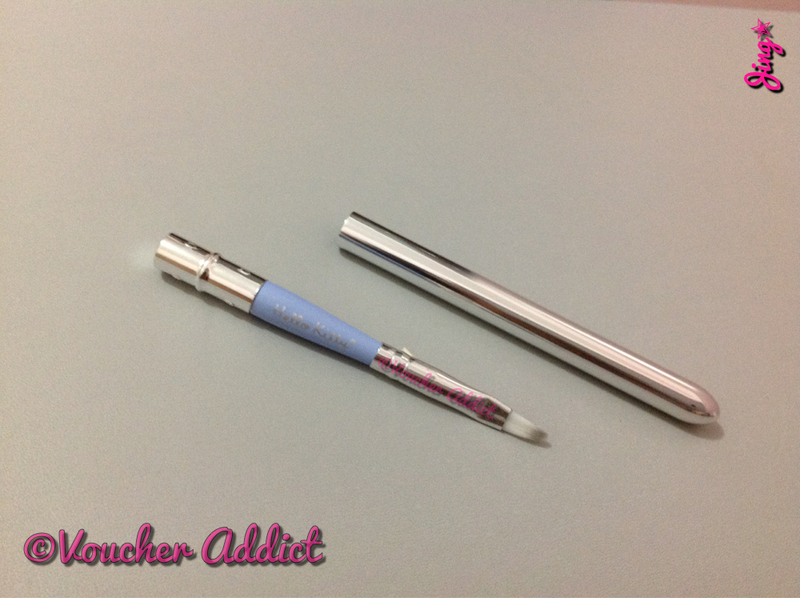 It did a precise job when used to apply color on the lower lash line. 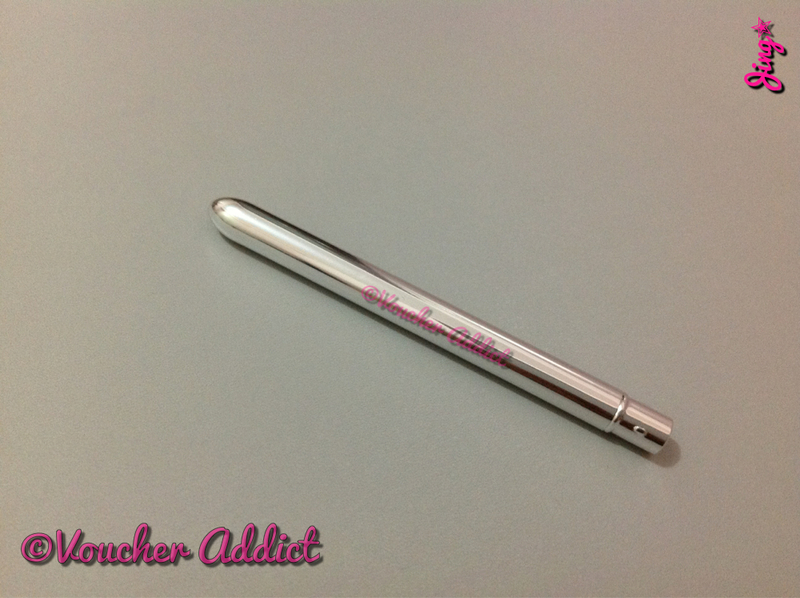 This lip brush became an instant favorite because it really looks cute in its silver cap. The brush also looks stiff but is really very soft and glides on smoothly when used with lip balms. I also tried using this with lipstick and the color applies evenly with each stroke. What surprised me was the minimal color stain on the bristles which comes off entirely after cleaning with a cleansing towel. 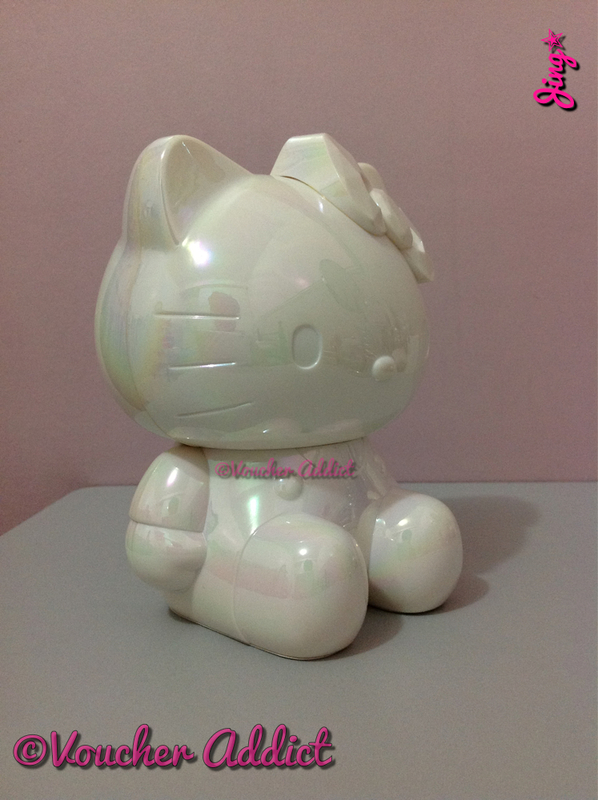 This product is almost too good to be true for an avid HK fan like me because aside from looking really cute, it also functions exceptionally well. 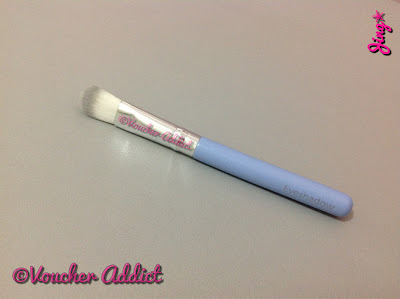 All the brushes are densely packed with soft bristles that glide smoothly on your skin. 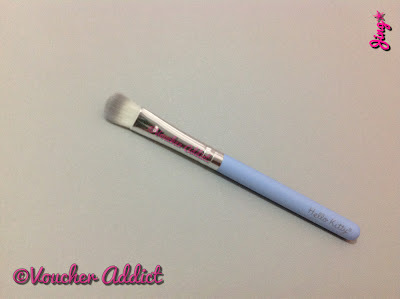 If you're familiar with make up brushes from The Body Shop, these brushes feel almost exactly the same. This set is also good in terms of brush selection because you can have a complete look with this set alone. 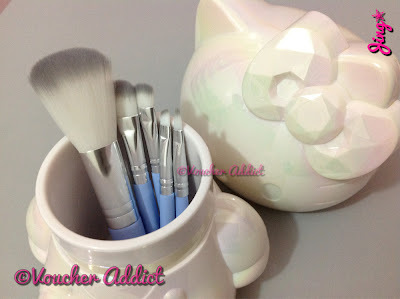 Although an extra face brush for applying blush would've made this set all the more complete, over all, I think this set DELIVERS great function with superior quality.